South African Rory Sabbatini secured victory in the Byron Nelson Championship in Texas on Sunday, firing a six-under-par final round 64 to give him a two-stroke win. Sabbatini finished with a tournament record 19-under-par total to win the Byron Nelson Championship. Sabbatini went into the final round tied for the lead with John Mallinger, but the American slipped to a level par 70 which saw him finish in sixth position. Sabbatini ended the 72 holes on a tournament record score of 261 (-19) to secure the fifth USPGA success of his career. England's Brian Davis, who has finished fifth in his previous two Tour events, also carded a 64 to finish second, while American D.A. 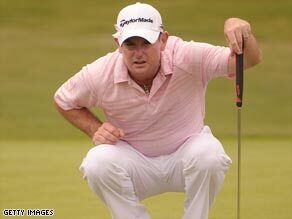 Points enjoyed his best PGA placing by finishing a stroke adrift in third position. Fellow-Americans Dustin Johnson and Scott McCarron, who fired a stunning 62, completed the top five finishers. Former Spanish Open champion Davis was joint leader after four birdies in five holes from the seventh hole, but Sabbatini moved clear again with birdies at 11 and 13 -- and three in a row starting at the 15th secured him a victory, despite Davis holing a 26-foot eagle putt on the long 16th hole. "It's a great feeling to win anything associated with 'Lord' Byron," Sabbatini told reporters in reference to the golfing legend that the tournament is named after. "We are going to be partying tonight."